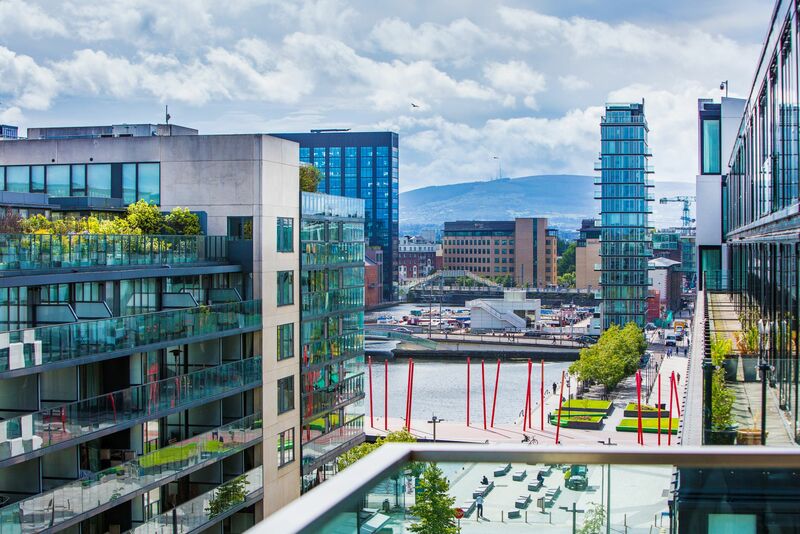 The development of the Docklands area of Dublin was a key driver in the construction sector during the boom and, while the bust interrupted proceedings, building is back again in this fascinating 1,285-acre part of the city. But it’s a tale of two halves in two distinct ways. The flurry of activity this time around, post-crash, is decidedly commercially driven and on the residential front, there’s a great difference in pricing between the northern and southern halves of the docklands, two halves conveniently divided by the River Liffey. 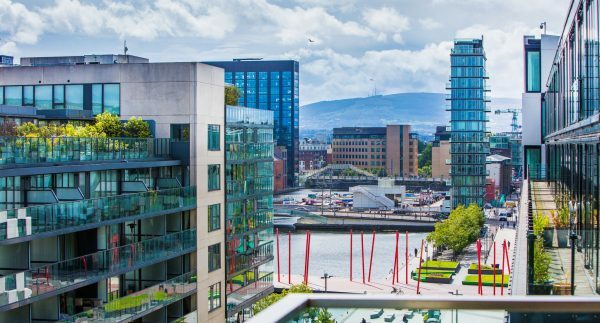 According to a survey conducted by agent Owen Reilly of his Docklands-based residential clients, which included details from buyers, investors and tenants, more than 85 per cent of the apartments to let on its books were rented by international tenants last year. Against a backdrop of low stock, the agent noted fast sales, an annual price per square metre inflation rate of almost 12 per cent, an average price per square metre of €5,619 and annual rent inflation of almost 12 per cent. “Last year was underpinned by a lack of supply. There were no residential completions in the Docklands in 2016 and there will be none this year either,” said Reilly. “Many of the properties we sold turned over in a matter of a few weeks, because of the lack of supply. The first new residential units should be delivered next year at Capital Dock, where Kennedy Wilson is building 210 apartments. “It’s fair to say that while there is obviously mixed zoning in the Docklands, a lot more resources are going into commercial than residential because they can be pre-let and forward funded. “It is more expensive and riskier to build residential units. You can’t build half a block of apartments. It all goes up at the same time, so there’s no phased development like that of a traditional housing scheme,” he said. The survey showed that of the units rented through Owen Reilly, only 15 per cent were rented by Irish tenants last year (down from 36.5 per cent in 2015); while the number of European tenants rose to 63 per cent in 2016, compared to 36.5 per cent the year before. The number of overseas, or non-EU tenants in the Docklands also dropped last year from 27 per cent in 2015 to 22 per cent. 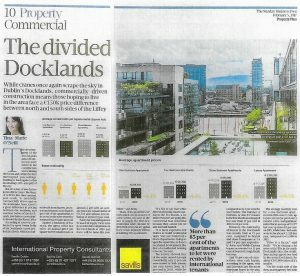 However, the nationality of buyers in the Docklands was mostly Irish at 72 per cent, compared to British and other Europeans at 5.6 and 7.4 per cent respectively. Asian and Middle Eastern buyers accounted for 13 per cent of buyers through Reilly last year. And 76 per cent of transactions were cash buyers, according to the agent, who said investors are the more dominant buyer in the area, which is a little out of reach of the first-time buyer market. The average monthly rent for a one-bedroom apartment in 2016 was €1,526, up 14 per cent on the previous 12 months. A two-bed apartment rented for an average of €2,177 last year, up almost 11 per cent on 2015, while three-bed units were let for about €3,320 last year, compared to €2,900 in 2015. “Price is a factor,” said Reilly. “We’re dealing a lot more with FTBs in the north Docklands than the south. You can buy a good two-bed in the north Docklands for about €350,000 or less if it’s smaller. To review the article on The Sunday Business Post website, please click here.